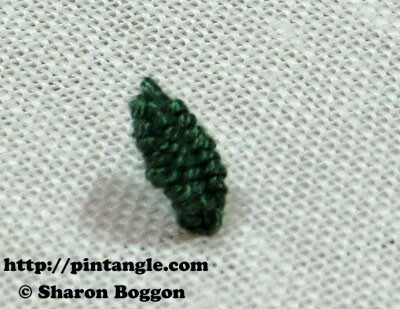 Closed base needlewoven picot or needlewoven picot leaf stitch when complete is very leaf like so you can use it any floral motif. This is a stitch that stands proud of the fabric and people find it amusing and cute. It takes a little time to work and quite a bit of thread but it is worth it when you see people reach to touch it. This is a closed base needlewoven picot. You can make them quite long and they look very effective if worked on mass. If you work them in a circle they form flower like petals. 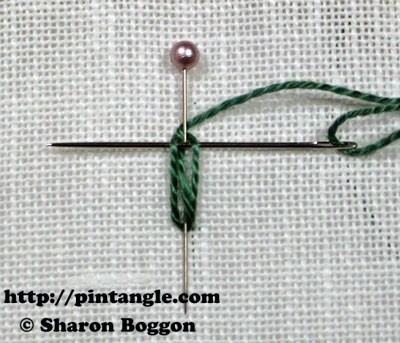 Use a blunt tapestry needle so that as you weave the threads you do not split the threads by accident. 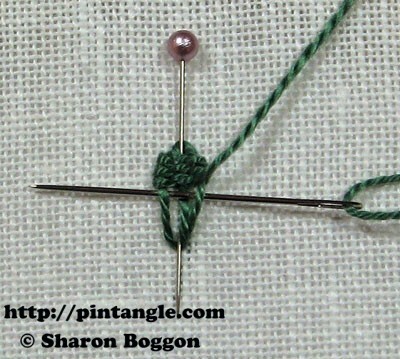 Place a pin in your work with the pin emerging from the fabric where you want the base of your picot to be. Bring the thread out at the base to the right of the pin. 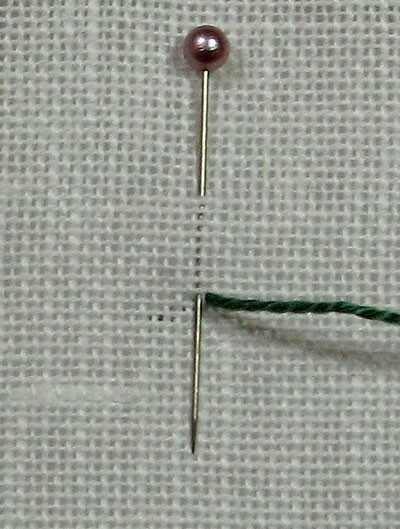 Take the thread up and behind the pin side as illustrated. Bring the thread out, a little to the left, at the base of where the pin emerges from the fabric. Take the thread and wrap it behind the pin. 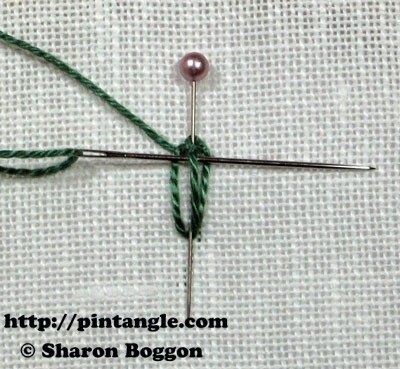 Have the thread cross the pin so that it wraps from the left side under the pin to the right as illustrated. Begin weaving at the top by sliding the needle from the right to the left, picking up the two outer threads. You do not pick up the middle thread. Pull the thread through firmly but not too tight. 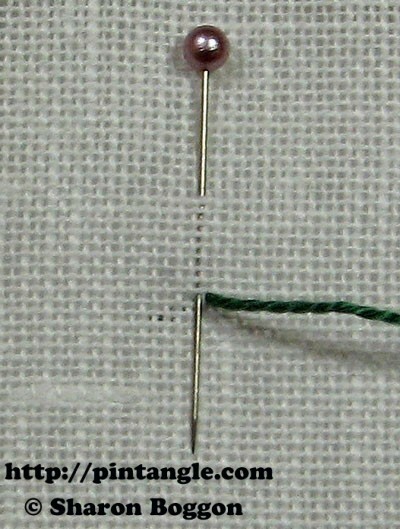 Turn the needle and continue weaving by sliding the needle from left to right picking the middle thread. The two outer threads are not picked up. Pull your thread through and continue in this back and forth motion. As you weave use the needle to pack the picot so that it firm. Continue weaving until the picot is packed firmly to the base. Take the thread to the back and secure with two small back stitches. 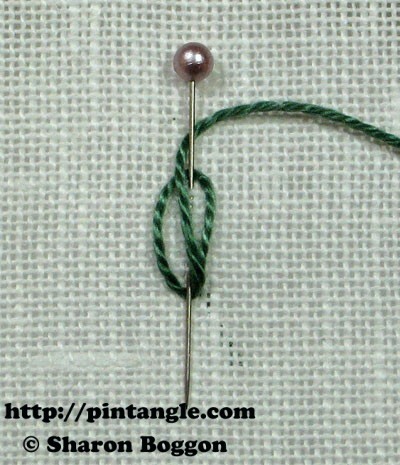 Remove the pin and you have a freestanding needle woven closed base picot. It looks like a leaf that stands proud of the fabric! Here is the closed base needlewoven picot. I liked this stitch. i’ve managed to get a bit more stitching onto my wonderful husband’s christmas stocking using this stitch. Due to teaching commitments, I was way behind on my TAST! But, now I’m good again. You can find my latest addition to the mandala on: http://stitchinfingers.ning.com/profile/JessicaGrimm. 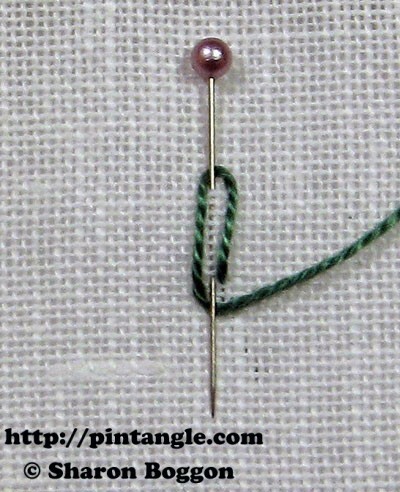 Here is my sample of closed base needle wiven picot stitch.. I haven’t had a lot of time to play the TAST, but I have managed to do a little of all the stitches I missed. I’ll try to get to see everyone else’s posts later this weekend or during the week… depends on how my computer behaves. Back in August I created a flowering cactus for my desert pebble (CD). Hi All – Here’s my example of the Woven Picot (slightly blurry – sorry). Sharon – I look forward to next year’s design challenge. I have started working on this stitch, my trials are on my blog. Hi Sharon, I’ve only done a small example this week ! Been so busy ! My son left this morning bound for the caribbean on a cruise ship, playing in a band and will be gone for 5 months ( crying !!!) Do better next week !!! Hi Sharon & Friends, my posts for the stitches 40 & 41. My sampler for woven picot stitch. I love this stitch (base closed and non closed) and ??? ?I am delighted that the Tast continue Next year. I had to work fast this week as tomorrow I am headed to Houston, TX for the International Quilt Festival. I am so excited to be going. I love this stitch! Very cool! This week I have an almost new stitch to learn!